Help CentreUsing SuperControl Managing guests, emails and auto correspondenceHow can I schedule emails to be sent automatically e.g. balance reminder? Ensure you have your letters set-up first before you schedule them. Click here to see how to add an email template. 1. Go to Emails/Letters > Automated emails/SMS. 2. Click Add new group, enter a Group name eg. “Guest emails” and select how they should automatically apply and click Add group. All Bookings: the email will apply to all bookings. Property Group Bookings: the email will only assign to selected property groups. Property Bookings: the email will only apply to selected properties. 3. Select Add new letter > Go. 4. Select your letter eg. Balance reminder then click Add letter. 5. Here you can set your criteria. This letter shows the schedule settings to send a Balance reminder if the guest has not paid their balance 42 days prior to arrival. 6. Once your criteria is set choose any attachments to include (these will only display if they are uploaded into SuperControl. For instructions to upload attachments click here). 9. To add additional emails to the same group repeat the process above. Nb: this is a great feature, however there are still times when a personal email is needed - eg to reply to answer a list of specific questions. 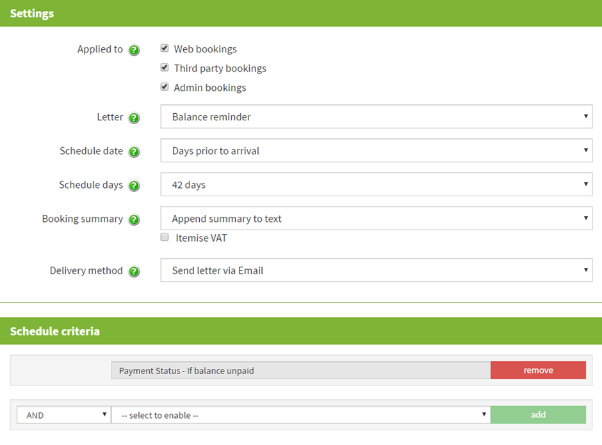 Prev: Can I edit the booking summary autoresponse? Next: Can I limit automatic emails for certain properties? My question was how do I set automated letter to be sent one day prior to departure but this does not answer that. I have set it at 0 days prior to departure but I fear guests will pack up and leave, re-enter the world and be too busy to reply. If you can add 'one day prior to departure' that would be perfect. I'm afraid there is not a "prior to departure" trigger at the moment. We hope to this added within the next few months. How can I send a letter to leisure/businness bookings only?? I'm afraid you can only send automated emails to bookings categorised either as web bookings, admin bookings or channel bookings. A possible workaround would be that you can add two booking sources "leisure" and "business" and then set your automated email criteria to send if either of these sources are selected in a booking.